On May 21, 1979, at the 96th Congress (1979-1980), Norman Y. Mineta (D-CA) introduced H.R. 4161, which was then referred to the House Committee on the Judiciary. On July 11, 1979, Assistant Counsel Ray D’Uva wrote to Chairwoman Elizabeth Holtzman (D-NY) to discuss a possible administrative, rather than legislative, resolution to the issue (see image). 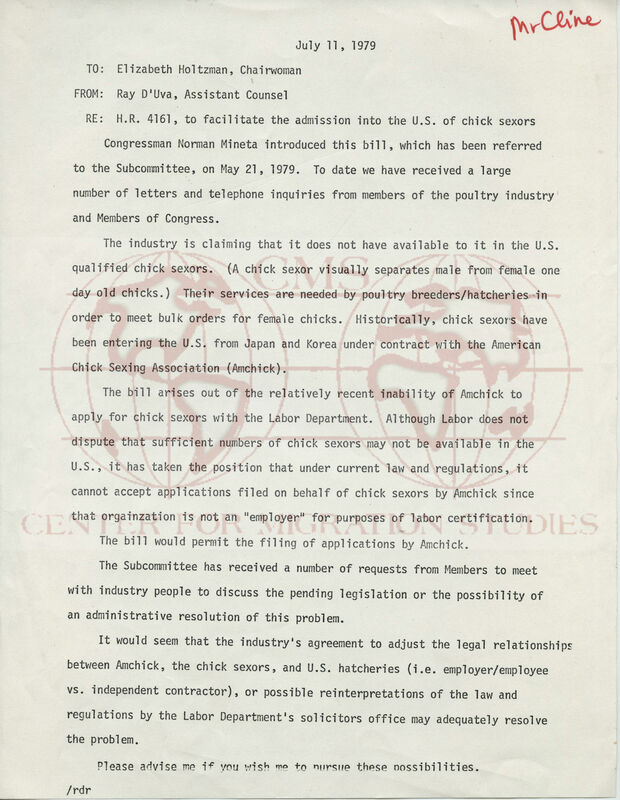 The issue in question: immigrant chick sexers and the (in)ability of the American Chick Sexing Association (Amchick) to file with the Labor Department on behalf of the chick sexers. As D’Uva summarized in the memo, the poultry industry claimed that there were not enough qualified chick sexers in the U.S. The Labor Department did not dispute that claim or the perceived need for immigrant chick sexers, but it took the position that it could not accept applications filed by Amchick on the sexers’ behalf because the organization was not an “employer” for purposes of labor certification. H.R. 4161 was “a bill to provide, for purposes of administration of certain provisions of the Immigration and Nationality Act, that entities which are prime contractors for chick sexors will be treated as employers with respect to such individuals”. Amchick was founded in 1938 by S. John Nitta, who learned the art of chick sexing in his native Japan and later opened chick sexing schools in America. World War II and growing discrimination against Japanese disrupted Nitta’s business, but he continued to train sexers, many of them fellow Japanese; “[b]y the dawn of the Eisenhower Era, well over 90% of America’s chick sexers were of Japanese origin”. However, Amchick’s U.S. sexing schools were closed due to lack of interest and instead the association began to import sexers from Japan and Korea, until the trouble with the Labor Department started. Japanese chicken sexers used to be the industry standard, with international demand sending Japanese experts to countries as far-flung as Denmark, Hungary, Spain, Germany, the U.S, and the U.K.[6,7]. However, traditional vent sexing is becoming a dying art, even in Japan, where trained sexers now number only in the hundreds. Although the demand for chick sexers still exists, just like in 1979 it is becoming increasingly difficult to fill that demand – even when one looks abroad. S. John Nitta, “Interview”. Interview by Mary Tamura. 1994. http://content.cdlib.org/view?docId=kt367n993t;NAAN=13030&doc.view=frames&chunk.id=d0e4418&toc.depth=1&toc.id=&brand=calisphere. Alexandra Gibbs, “Chick sexer: The $60K a year job nobody wants”. http://www.nbcnews.com/better/careers/chick-sexer-60k-year-job-nobody-wants-n317481. such individuals.” Congress.gov. May 21, 1979. Accessed March 02, 2017. Nitta, S. John. “Interview.” Interview by Mary Tamura. 1994. Accessed March 4, 2017. Slodkowski, Antoni. “Chicken sexers in Japan lament the decline of an industry.” Reuters. This entry was posted in Center for Migration Studies (NY) and tagged 96th Congress, Amchick, Center for Migration Studies, Chick Sexing, Cline Papers, Congress, Elizabeth Holtzman, Immigration, Norman Mineta, Ray D'Uva, S. John Nitta. Bookmark the permalink.